The Juno mission to Jupiter has been divided into 13 mission phases with different durations. 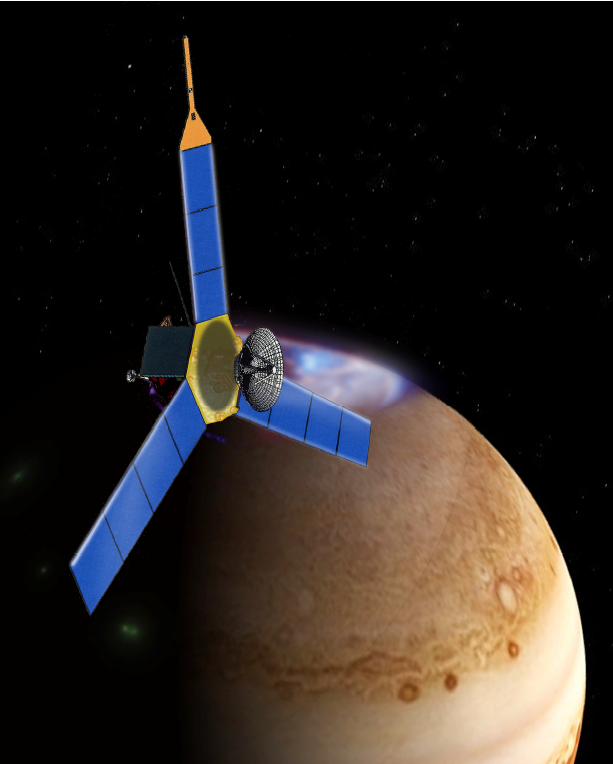 Each mission phase has its own specific milestones and events as the long Juno mission progresses. The Juno flight begins in August 2011 and is planned to have a duration of six and a half years, lasting until February 2018. Launching in August 2011, Juno is being placed in a heliocentric orbit that takes it beyond the orbit of Mars leading up to two Deep Space Maneuvers about 13 months after launch, when Juno is reaching aphelion. 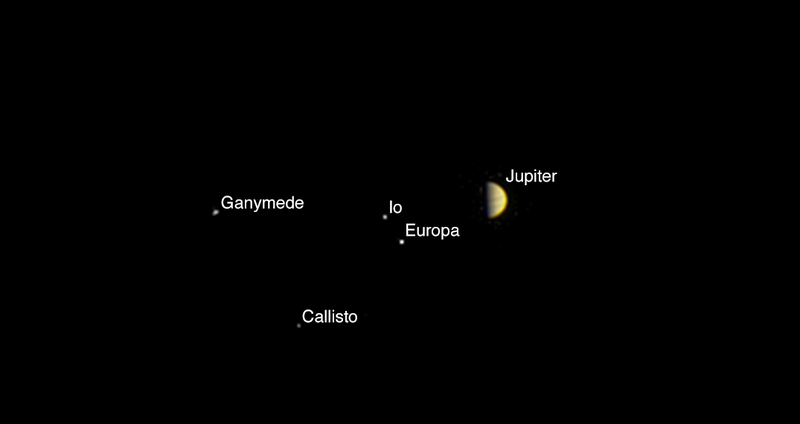 Afterwards, Juno is inbound again to set the stage for a Gravity Assist Flyby of Earth in October 2013 to boost the spacecraft velocity in order to put it on a trajectory to Jupiter. More than two years of Quiet Cruise follow before the Jupiter Approach Phase Begins for the final 178 days prior to Juno’s arrival. To insert itself into Jupiter Orbit, Juno performs a large Orbit Insertion Maneuver to place it in a 107-day Capture Orbit during which a Period Reduction Maneuver is performed to achieve the 14-day science orbit. 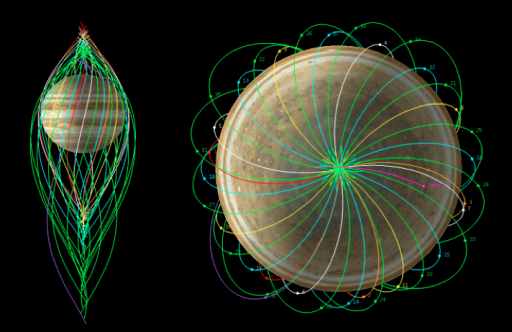 Juno conducts a total of 33 science orbits before the planned end of the mission approaches. After passing perijove on Orbit 36 (Closest approach to Jupiter), Juno makes a deorbit burn to prepare for EOM (End of Mission) via destructive entry into the Gas Giant. When the Mission has ended, scientists perform two years of data analysis. The name of Juno’s trajectory to Jupiter is formally known as ‘2+ dV-EGA’. EGA stands for Earth Gravity Assist and the 2+ specifies the timing of that flyby occurring a little more than two years into the mission. dV indicates that Juno utilizes a hyperbolic excess velocity leveraging trajectory. This trajectory is attractive because it features a short flight time to Jupiter while saving launch energy costs. Juno’s Launch window was limited by a number of mission events and their timings such as the Deep Space Maneuvers, the Earth Flyby, the Jupiter Insertion and the science orbits. In addition, the Mission design was limited by the Launch Energy and the dV budget (Delta Velocity, Velocity changes through engine burns). Juno’s Pre-Launch Mission phase begins 72 hours prior to liftoff to L-45 minutes. The spacecraft is powered up three days before launch for final status and health checks prior to countdown operations. 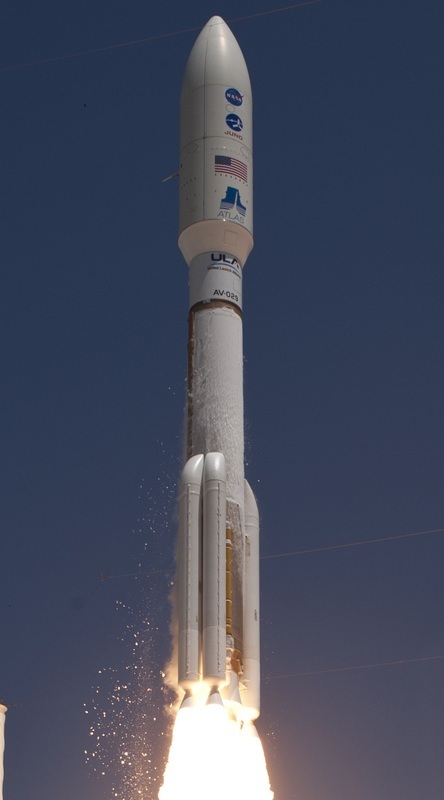 Mating to the Centaur Upper Stage of the Atlas V Rocket occurs 10 days prior to liftoff, one week before Pre-Launch starts. The final days leading up to liftoff are dedicated to integrated testing of the launcher and the Juno vehicle. At L-45 minutes, Juno is in its final configuration for launch. Juno’s launch window extended from August 5 to August 26, 2011 with at least 60 minutes of window open time each day. The launch period was optimized to maximize injected mass into Jupiter science orbits. 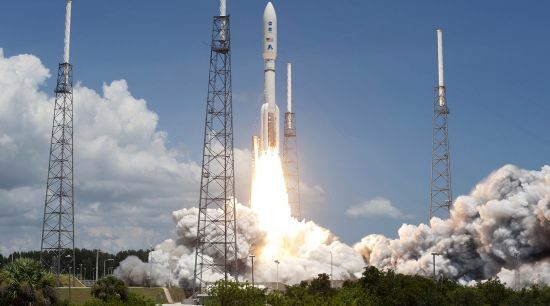 The launch period was designed to keep the overall launch energy and Deep Space Maneuver delta-V low while meeting constraints imposed by spacecraft requirements and navigation limitations. Through the Period Reduction Clean Up Maneuver, the mission has a dV budget of around 2,000m/s. Juno launched at 16:25 UTC on August 5, 2011, the first day of the 21-day launch window. 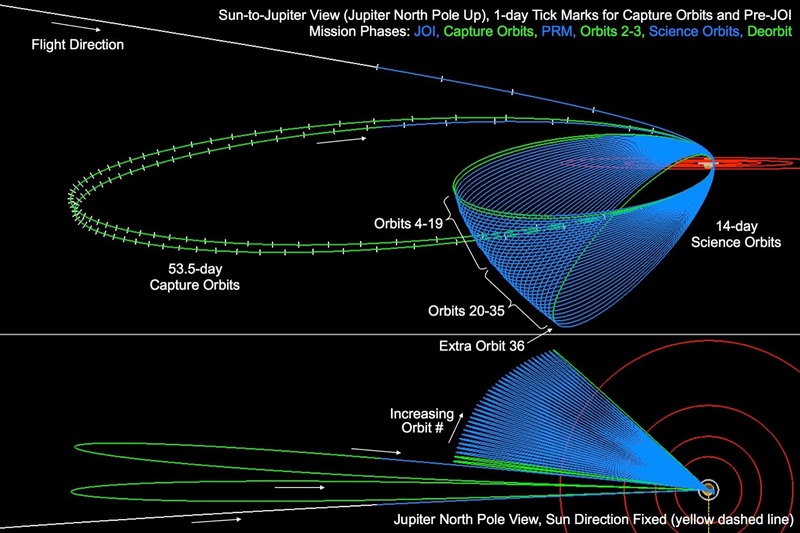 The exact day Juno launches was of great interest to trajectory and mission planners that put much though into developing the launch window (refer to the Trajectory Sections on this page). After blasting off, the five SRBs boosted the vehicle during the initial 90 seconds of the flight along with the RD-180 main engine of the first stage. 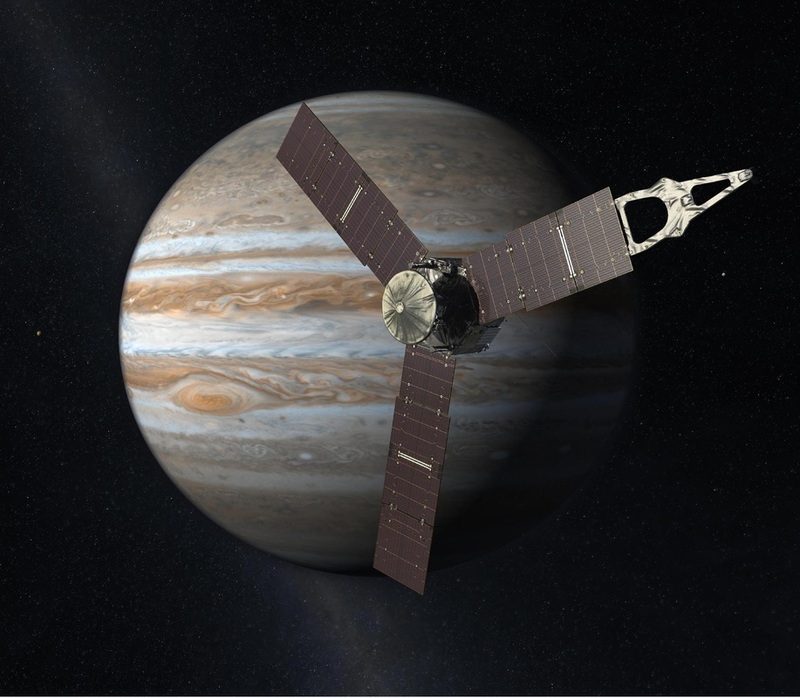 One crucial step of the Juno Mission was the deployment of the vehicle’s three solar arrays. The deployment sequence was initiated 5 minutes after spacecraft separation and had a duration of about three minutes. Pyrotechnic devices, which are known to be the most reliable solution for spacecraft deployments, were used to free the arrays from their stowed position. One set was used to free the arrays and another set was used to deploy them. Solar Array Deployment was as expected and Juno was healthy as it departed Earth to begin its long, long mission to the Gas Giant. Juno is a spin-stabilized spacecraft. The vehicle receives its initial spin-up from the Centaur Upper Stage which spins up the Spacecraft prior to separation. Spin stabilized spacecraft provide several advantages. First, spinning makes spacecraft pointing extremely stable and easy to control. Second, achieving vehicle stabilization by spinning eliminates the need of Reaction Wheels which would add weight to the spacecraft that would come at the cost of a science instrument. During its mission, Juno spins at different rates depending on mission maneuvers. During Cruise, Juno makes one rotation per minute, during science operations, the spin rate is 2rpm and for Main Engine Burns, the spin rate is increased to 5rpm. Cruise begins roughly three days after launch and continues for nearly five years as the vehicle makes one-and-a-half orbits around the Sun, a close Earth Flyby and Deep Space Maneuvers before reaching the vicinity of Jupiter where the Jupiter Approach Phase is started. Juno’s path to Jupiter is divided into four different types of cruise phases. The Inner Cruise Phases occur mostly within the Orbit of Mars with a period outside the Orbit during Inner Cruise 2 where the DSMs take place, and the Quiet Cruise which is the longest phase of the mission with a duration of more than two years. The first longer Mission Phase of the Juno Mission is used to perform spacecraft health status checks to make sure all systems have survived the launch environment. Instruments are powered up and checked briefly to confirm vehicle health. In addition, vehicle deployments are performed. These include the two Waves Antennas. At about L+30 Days, Juno makes its first small course correction using its Reaction Control System Thrusters to adjust its path out into the Solar System and account for any injection inaccuracies by the Launch Vehicle. At L+66 days, the Inner Cruise 2 Phase begins. Inner Cruise 2 has a significant length of 598 days (1.6 years) and features a variety of spacecraft operations. During IC2, the vehicle uses its High Gain Antenna for communications for the first time as part of nominal communications system commissioning. In addition, the science instruments of the vehicle undergo extensive checkouts during that phase of the mission. Four instruments, the Magnetometer experiment, JEDI, MWR and Waves, will be active for a large portion of IC2 for calibration and science data acquisition of the space environment. 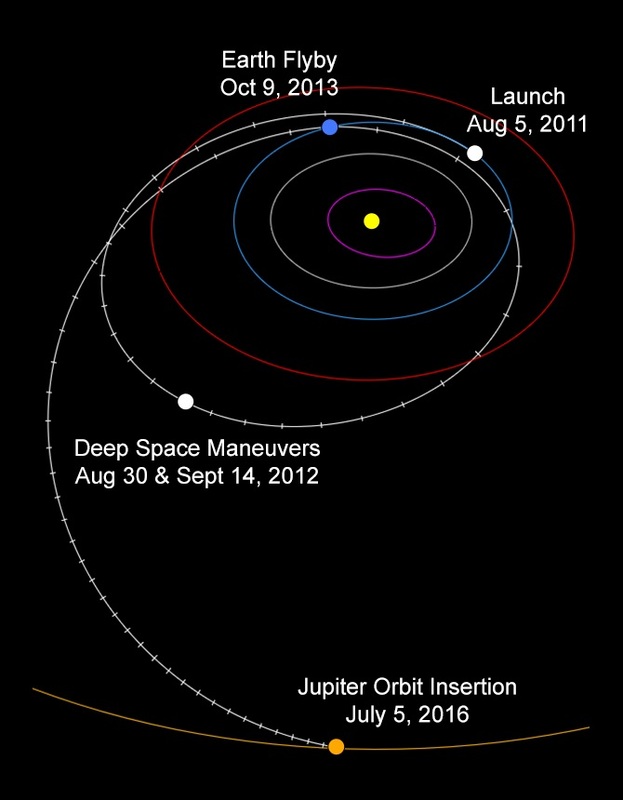 During Inner Cruise 2, Juno crosses the Orbit of Mars and flies beyond it to reach Aphelion on September 2, 2012 and start its trip back to the inner Solar System. Aphelion is about 2.26 Astronomical Units. 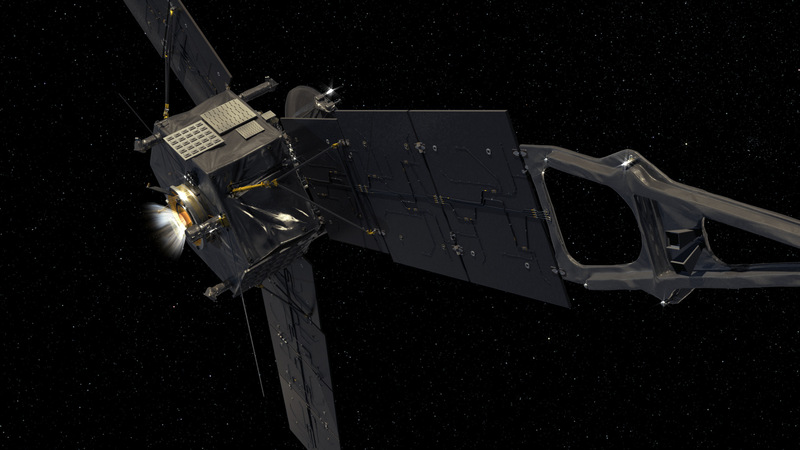 Around the time of aphelion pass, Juno performs is two Deep Space Maneuvers. When coming close to aphelion, Juno performs two large Deep Space Maneuvers. These events are critical mission events of the 2+ dV-EGA Mission Trajectory because they target Juno’s Path back to Earth. Without the DSMs, Juno would be stuck in Heliocentric Orbit for all eternity. Theoretically, the DSMs could be performed with a single burn which would actually provide a better net result in terms of required delta-V, but the burn was cut in half since the Leros 1b main engine of the spacecraft was not qualified for 60-minute burns prior to Juno’s launch. 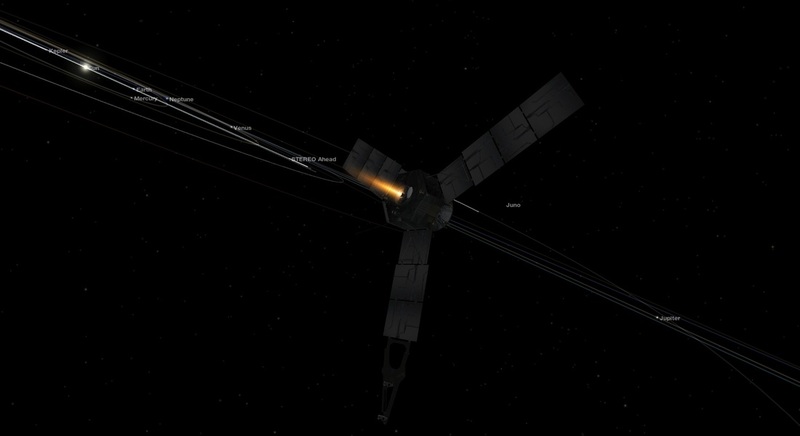 To avoid main engine problems, two DSMs were implemented in the mission profile, each with a length of about 30 minutes, with burns taking place two days prior and two days after aphelion. Ten days after the second DSM, Juno uses its Reaction Control System to perform a post-DSM Clean-Up Maneuver to precisely align its trajectory to the planned path towards Earth. The DSMs are prepared in several months in advance. Juno starts loading its fuel lines and activating heaters of the bi-propellant propulsion system about two months before the DSM. The Helium Tanks that contain Helium pressurant for the main propulsion system are heated up one month before the DSM and the Engine Cover is opened 7 days prior to DSM1 and the vehicle batteries are charged to 100% capacity which is standard for major mission events. Commands for the DSM sequence are uplinked several days beforehand after Deep Space Network Tracking is increased to get the latest and most precise tracking data to generate the burn parameters. The DSM sequence begins 48 hours before each of the burns. About 45 minutes prior to a burn, Juno makes a re-orientation to the burn attitude, leaving its nominal flight attitude, pointing its High Gain Antenna off Earth, meaning that only low gain communications are available during the burns. Via the toroidal Low Gain Antenna of Juno, MFSK Tones are sent to give insight into vehicle and burn status. These tones are also used for Jupiter Orbit Insertion which gives teams a chance to familiarize themselves with the system. 15 minutes after each burn, Juno returns to the nominal attitude to continue its Cruise. Lots of consideration went into the timing of the launch window to correctly time the Deep Space Maneuvers with respect to the Launch Window and the Jupiter Science Orbit. Optimizing the Deep Space Maneuvers from a dV standpoint required a launch at the maximum C3 for this mission since the dV is maximal when the C3 has a local minimum that occurs in the middle of the launch window. A launch at all dates in the 21-day launch window was possible, but certain dates early and late in the window allowed DSM dV savings that could become useful in case of trajectory anomalies later on. Targeting the DSMs and, in turn, adjusting the launch window and initial flight trajectory became necessary to avoid a solar conjunction during which Juno was very close to the Sun as seen from Earth. This would have made vehicle tracking and communications difficult and precise tracking is a requirement to target the DSMs and the post-DSM Clean Up. 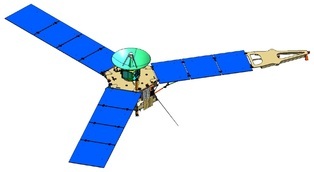 Radio signal degradation due to solar interference had to be mitigated in the Mission Design Process, so that the dates for the DSMs were dependent on the actual launch date of the mission while all other mission events were fixed for the entire launch window (Flyby, Jupiter Orbit Insertion, Period Reduction Maneuver, Science Phases and Deorbit). Mission designers developed the following requirements for the Solar Conjunction: 1) facilitate at least two days of vehicle tracking before DSM1 with Sun-Earth-Spacecraft angle greater than 10 degrees, 2) perform the DSMs at an SEP of more than 3 degrees. Also, at least two days of SEP>10 were required in the first four days after DSM2 for tracking data acquisition for the DSM clean up burn. In addition to these constraints, there was another angle that had to be considered, the Earth Look Angle – ELA. The ELA is a factor for Juno Toroidal Low Gain Communications for the DSMs taking into account the relative position of Earth, Juno’s Main Engine and the Low Gain Antenna. ELA is the angle between the dV direction and the off-boresight performance of the LGA which is optimal at 90 degrees. For a good radio signal link, the ELA has to be between 80 and 100 degrees. But, there is a 6-degree cut-out because Juno has to be tracked via doppler shift that is not effective close to an ELA of 90 degrees. To meet all these requirements, the twin DSM pair was placed after the Solar Conjunction that caused an SEP<3 cut-out from August 7 to August 19, 2012 and an SEP<10 cut-out from July 26 to August 29, 2012. Also, the ELA cut-out from late July to mid-August was implemented. This resulted in DSMs being targeted for August 30 (dV: 345m/s) and September 4 (dV: 385m/s) which is the latest in the ELA window. Targeting was accomplished by adjusting the TCM-1 and DSM dV. This came at the cost of additional dV which raised the missions total dV budget which was in turn mitigated by a modified Jupiter Science Orbit insertion. Once being back inside the Martian Orbit, at L+661 Days, Juno begins the Inner Cruise 3 Phase which is shorter than IC2, but a bit more intense. The 161 days of IC3 are busy for the Juno Mission Team that rehearses a full cycle of integrated spacecraft operations around the time of the Earth Flyby that Juno will make. Also for the Flyby, more instruments will be turned on to acquire science data from Earth’s environment, both, for calibrations and to support other studies. An additional benefit of the Flyby is to give mission controllers the opportunity to practice operating the instruments and the spacecraft in general in preparation for the science mission. On its trip inbound, Juno crosses the Orbit of Mars again in mid-April 2013 before starting to chase Earth crossing its orbit around July, 19, 2012 flying into the Inner Solar System, reaching its perihelion at 0.88 Astronomical Units on August 31, 2013 (GMT). Leading up to the Flyby, Juno has three planned Trajectory Correction Maneuvers to precisely target the Gravity Assist Flyby to get the right velocity increase out of it and pass Earth at the correct distance. 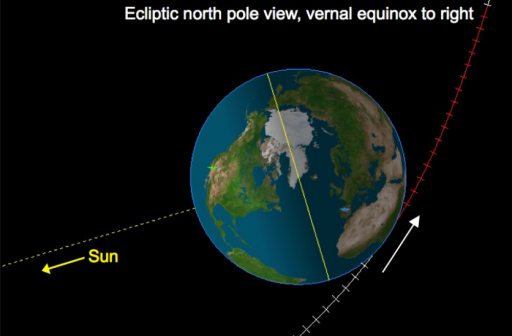 Earth Flyby occurs on October 9, 2013 with closest approach at 19:21 UTC. 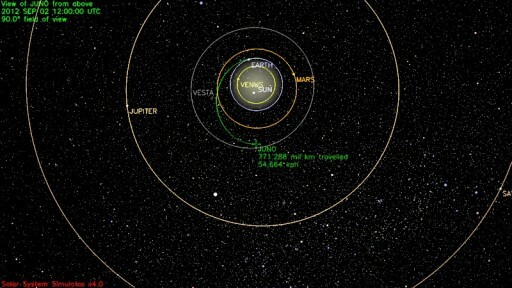 Juno comes as close as 559 Kilometers. Perigee occurs 200 Kilometers off the southeastern coast of South Africa. The Earth Flyby has about +/-100 Kilometers of margin to perform hazard avoidance maneuvers, but generally a higher flyby altitude is preferred over a lower pass. In case of a higher flyby, residual dV would have to be provided by the spacecraft. The Gravity Assist Flyby supplies Juno with a delta-V (Velocity Change) of 7.3 Kilometers per second (26,280kph, 16,330mph). With is additional velocity, Juno’s Orbit around the Sun is modified in a way that takes the vehicle’s aphelion outside Jupiter’s Orbit crossing its orbit at the correct time to intercept the planet. Following the Flyby, Juno makes one additional Trajectory Correction Maneuver to fine-tune its path to Jupiter. The Gravity Assist Flyby will mark the only time on Juno’s mission that the vehicle is in full eclipse as it passes through Earth’s shadow. Eclipse time is about 20 minutes and Juno charges its batteries to 100% before the event so that there are no concerns regarding electrical power. Afterwards, Juno is in sunlight until the end of the mission because the design of Juno’s Orbit around Jupiter that allows maximum sun exposure because at Jupiter’s distance to the the Sun, Juno will receive only two to three percent of the sunlight it received near Earth. The Quiet Cruise Phase begins 822 days after launch and has a duration of 791 days (2.2 years). It begins after the Earth Flyby and associated science and simulation activities are complete and Juno is back at a large distance to Earth entering nominal cruise operations again. During Quiet Cruise, there are no special spacecraft events such as TCMs or significant science operations. Instrument Checkouts and data acquisition as well as vehicle maintenance operations continue throughout the phase. Juno crosses the Orbit of Mars for the third and final time in early January 2014 when it is outbound from the inner Solar System and on its final path to Jupiter. When Quiet Cruise approaches its end, the Juno Mission and Science Teams will be staffed as needed for upcoming operations at Jupiter. The last six months (178 days) of Cruise Operations are designated Jupiter Approach Phase. During this period of the mission, Juno can make several contingency TCMs should its trajectory require additional fine-tuning. 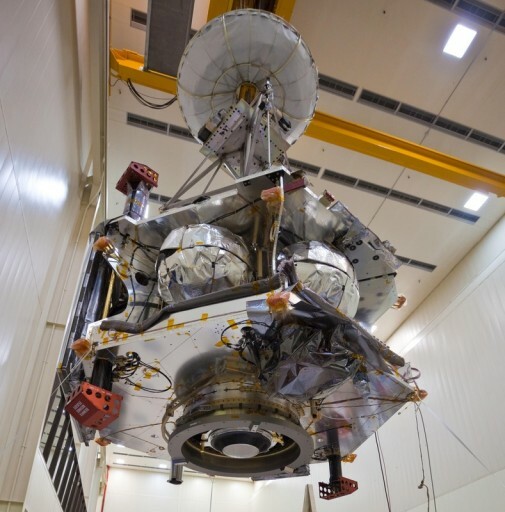 As the Spacecraft gets close to Jupiter, all instruments undergo final checkouts and calibrations and start early observations of Jupiter’s distant environment. Calibrations and data acquisition is needed to validate instrument performance in the Jupiter environment and to prepare the team for successful instrument operation and for returning baseline science data starting in Orbit 3. 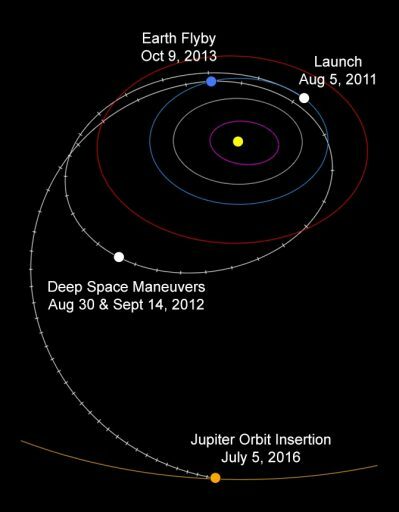 During the Approach Phase, the Deep Space Network increases tracking operations to ensure that valid trajectory information is available to precisely target the Jupiter orbit insertion burn. The JOI Phase begins four days ahead of the Orbit Insertion Burn with the initiation of the automated sequence aboard the spacecraft running on commands that are sent to the vehicle several days and weeks in advance. The phase ends one hour after the JOI Burn Ignition. JOI occurs on July 5, 2016 at 2:30 UTC Spacecraft Time, 3:18 UTC Earth Receive Time. Jupiter Orbit Insertion is performed at the close approach of the trajectory, called perijove. This point has to be targeted precisely and is planned to be 4,200 Kilometers above the 1-bar level of the Gas Planet. If Orbit insertion has occurred at a higher altitude, a perigee lowering maneuver would have been required to achieve the science orbit which would have negative consequences for the dV-Budget of the mission that was a major factor for Juno Spacecraft design. The JOI maneuver and its timing was constrained by more factors. 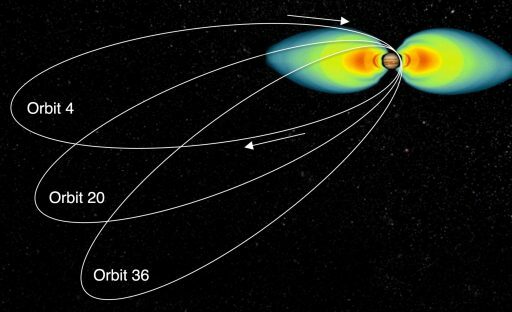 To avoid Jupiter’s intense radiation belts for JOI and the rest of the flight, the trajectory had to be designed in a way that avoids the torus and have Juno pass through the zone between Jupiter and its Radiation Belts. 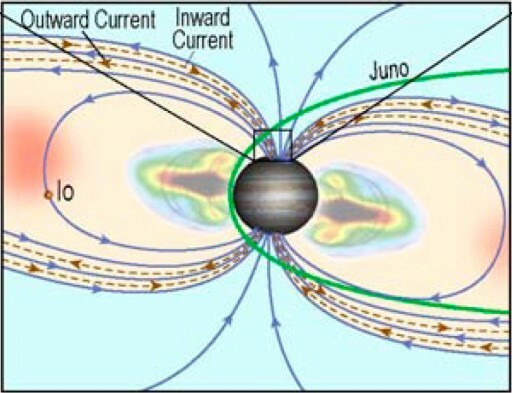 In addition, Jupiter’s magnetic field shows longitudinal variations which also had to be considered, because Juno spins at 5rpm for the maneuver making its communications system vulnerable to magnetic field interference. That is why Juno’s JOI trajectory was placed above a region of lower magnetic field magnitude to allow stable communications. Having Juno send live telemetry data to Earth is also an important aspect of JOI. 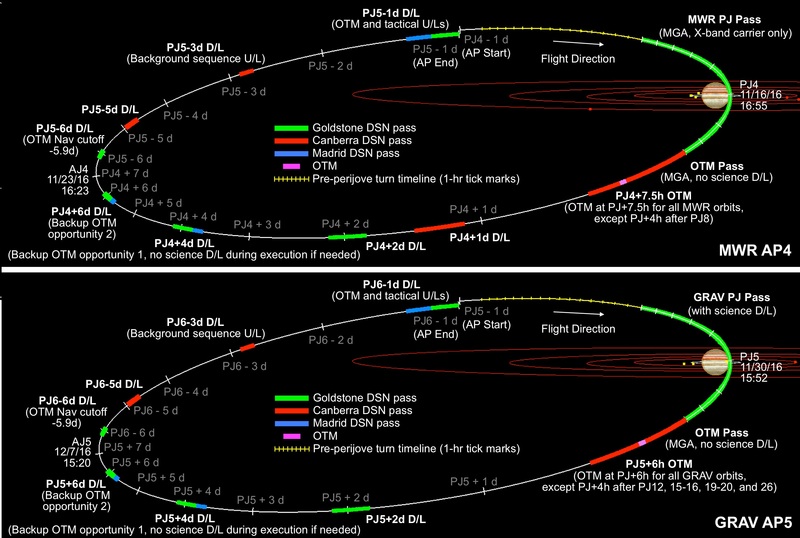 Because the insertion into Jupiter Orbit is a mission event of major importance, flight rules require dual Deep Space Network Coverage to have a redundant communications path in case of any problems making sure data from the vehicle is recorded for possible failure analysis in the unlikely case of LOM (Loss of Mission). The Goldstone-Canberra overlap has a duration of roughly three hours giving trajectory planners a narrow window with respect to both, making sure Juno flies through the area of limited radiation and that JOI takes place during overlap. In addition, the timing window is narrowed further since pre-burn events are considered critical as well, so that JOI takes place well into the overlap. The JOI Burn has a duration of 35 minutes and supplies Juno with a dV of 542 meters per second. Well before the burn, Juno makes a re-orientation maneuver to the correct attitude for the retrograde JOI Burn. The attitude change takes place 30 minutes ahead of TIG (Time of Ignition) and points the High Gain Antenna away from Earth so that during JOI, there can be no higher bandwidth communications with the vehicle. During JOI, Juno uses its toroidal Low Gain Antenna to send Tones that can be picked up by DSN Goldstone and Canberra. The MFSK Tones library has a total of 256 tones which are semaphores that are sent by the spacecraft to provide a low-bandwidth form of relaying vehicle status. Each tone is 10 seconds in duration – there are tones known as heartbeat tones that are used to signal that the spacecraft is alive and performing its tasks. In addition there are event tones with two tones assigned to each event – one positive tone for completion of an event and a negative tone that is sent in case of a failure to complete an event. These tones are the only way of communication available during JOI and provide basic insight in the progress of events at Jupiter. The communications delay (one-way signal travel time) on July 5, 2016 is 48.3 minutes. After the JOI Burn is complete, Juno uses its Reaction Control System to maneuver back to its nominal attitude, pointing its High Gain Antenna towards Earth to enable a higher data rate exchange of information. One our after JOI TIG, the mission switched to the Capture Orbit Phase. The Jupiter Orbit Insertion Burn places Juno in a highly elliptical orbit around Jupiter with an inclination of 90 degrees (+/-10 degrees) and a period of 53.5 days. This mission design feature benefits the mission’s total dV that decreases in the scenario of a pair of Capture Orbits being implemented into the mission. This also eliminates the concern of making burns in excess of 60 minutes with the Leros main engine. Injecting Juno in a capture orbit instead of a direct insertion into the science orbit decreased the total mission dV by 170m/s. A few days after the JOI Burn, Juno performs a Clean-Up Maneuver to target the time and location of the large Period Reduction Maneuver that is made after the Capture Orbit is complete. During the long initial Orbit around the Gas Giant, Instruments are turned back on after Jupiter Orbit Insertion. About 50 hours after JOI, all instruments are planned to be powered up and start gathering science data. 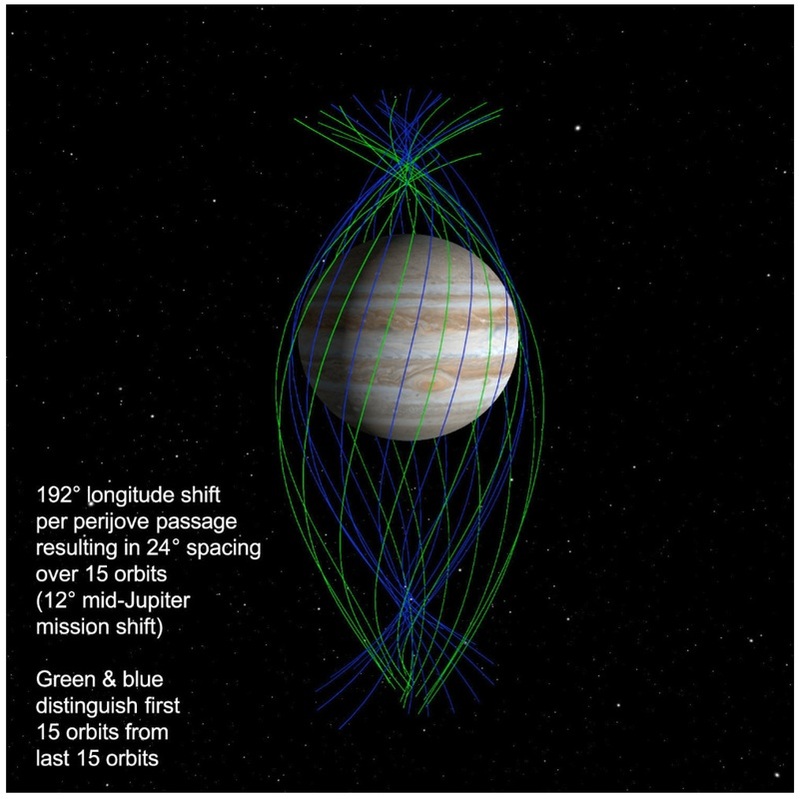 As with Jupiter Approach, the duration of the Capture Orbits is utilized to perform more instrument calibration in the Jupiter environment and to obtain initial science data. Teams have sufficient time to learn about instrument and spacecraft behavior during the Capture Orbits so that no additional time is needed when the science phase begins. The initial plan called for a single 107-day capture orbit followed by a Period Reduction Maneuver to lower Juno into its science orbit. After a change implemented after launch, the mission will aim for a 53.5-day orbit so that a pair of orbits can be made before the Period Reduction, giving the mission team an opportunity of exercising the science instruments during a low pass over Jupiter’s cloud tops ahead of the formal initiation of the science phase. Towards the end of the second Capture Orbit, science activities are suspended for the Period Reduction Maneuver that will shorten Juno’s orbit by significantly decreasing the apojove. This mission phase begins 126 hours (5.25 days) before the PRM TIG around perijove and ends 50 hours after the conclusion of the maneuver. 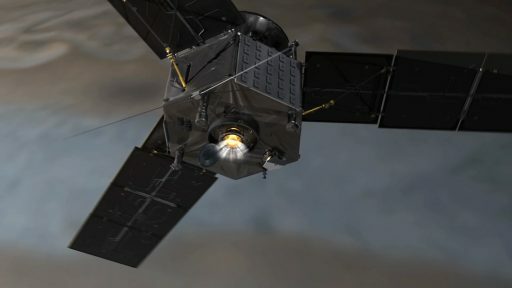 The Period Reduction Maneuver is the final Main Engine Burn of Juno’s Mission. It takes place on October 19, 2016 with a Time of Ignition of approximately 18:00 UTC depending on actual JOI values and the cleanup maneuver. Juno’s Period Reduction Maneuver, in its general architecture, will be very similar to the Jupiter Orbit Insertion Burn: Juno will point away from the sun and Earth, begin sending status tones, face its engine towards the direction of travel and fire to slow the spacecraft down. The burn has a duration of around 22 minutes and provides a dV of over 350m/s. After the PRM, Instruments are powered back on and the Orbit 1-2 set-up phase begins. After the Capture Orbits and the PRM, Juno is in its science orbit with a clean-up orbit (#3) starting on November 2 following the Period and Perijove Reduction Maneuvers in October. The first clean science orbit will start on November 16, 2016 and the last on February 6, 2018 (#36, Extra Orbit). Through Orbit 36, Juno performs science operations before the planned End Of Mission occurs on orbit 37. Juno orbits Jupiter in a highly elliptical, polar Orbit of around 90 degrees with an apojove of over 39 Jupiter radii and a perijove of 1.06 Jupiter radii allowing it to come as close as 4,200 Kilometers to the cloud tops of the planet. The 14-day orbit (in actuality it is not exactly 14 days in duration, continue reading for the explanation) is filled with activities such as science data acquisition and regularly performed communications sessions with Earth. The science orbit of the mission was extended from 11 to 14 days in order to obtain a global record of Jupiter in just eight orbits instead of the previously planned 15. The next eight orbits will fill in the gaps between the first eight and the last 16 will again be placed in the gaps of the first 16 to gather a detailed map of the planet’s gravitational and magnetic fields as well as the atmosphere. The primary science portion of each orbit is only 6 to 8 hours in duration, perijove +/-3 to 4 hours. During these eight hours, Juno is close enough to the planet to obtain its primary science data at the desired resolution. 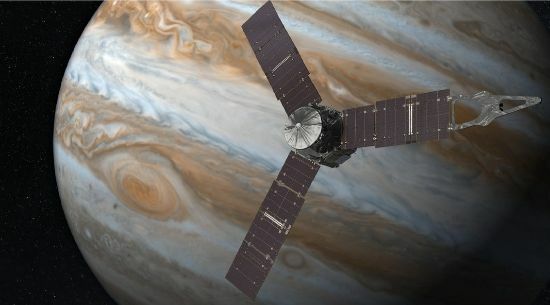 During the rest of the orbit, the science instruments are active as well and data on Jupiter’s environment is provided. At P+5 to 8 Hours (5 to 8 hours after perijove) on each orbit, Juno performs an OTM – Orbit Trim Maneuver that adjusts the Orbit of the vehicle in order to target the next science pass, especially concerning its longitude. Juno’s science mission has been designed to maximize the coverage of Jupiter in the first orbits of the mission before the later orbits focus on increasing the resolution of measurements. This is done to ensure a global picture of Jupiter is obtained very early in the mission, protecting against a loss of one or more instruments later in the mission due to the extreme radiation encountered at Jupiter. The first four orbits are set up to shift 90 degrees in longitude per orbit with the next four orbits then placed into the gaps to bring down the overall spacing to 45 degrees. Next, eight orbits will be placed right into the gaps to bring the longitudinal spacing to 22.5 degrees. The second half of the primary mission, 16 orbits, again target the leftover gaps to reduce spacing to 11.25 degrees. The final orbit (36) can use its OTM to target any region that scientists want to scan again or it can be used to repeat a science orbit that was missed due to vehicle problems. As a result of the OTMs, Juno’s perijove altitude climbs over the course of the mission from 4,147 Kilometers (Oblate Altitude) to 7,950 Kilometers after Orbit 36. During a nominal gravity science orbit, there are three tracking and communications sessions with DSN Goldstone. Each of these sessions has a duration of eight hours with one session occurring two days after perijove and the remaining two performed around apojove. In addition, there is another 10 hour communications session before the next science pass operation is started. This is session is divided – the first eight hours are covered by Canberra and the final two hours which represent the tracking data cutoff, are covered by DSN Madrid. The following 1.5 days are used to compute the trajectory of Juno and to develop the maneuvers for the perijove pass and the following Orbit Trim Maneuver. These are uplinked at P-1 day by DSN Goldstone which resumes tracking 20 hours later for Ka-Band Ranging. 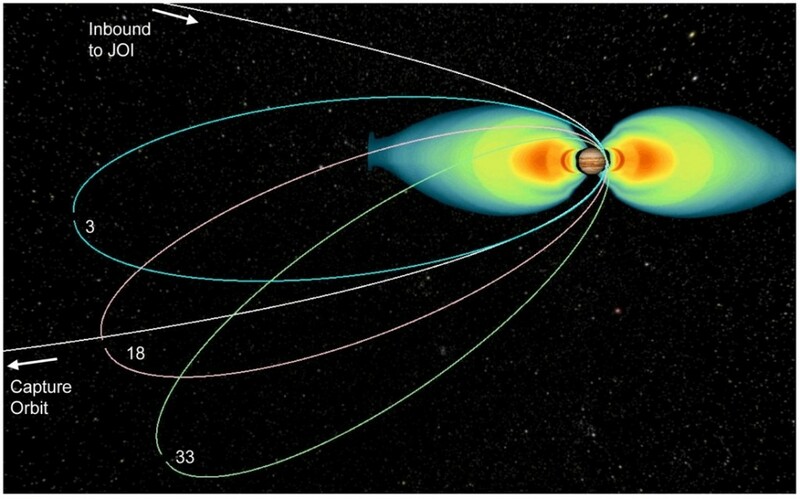 Jupiter’s radiation belts, that are to be avoided to prevent Juno from getting harmed early in the mission, form a torus around the planet (donut shaped ring around Jupiter). Avoiding these belts is a top priority and is accomplished by approaching Jupiter’s North Pole and diving beyond the radiation belt, moving from pole to pole in about two hours during which perijove occurs. After making its close approach, Juno’s highly elongated orbital trajectory carries the spacecraft away from Jupiter, outside the intense radiation belts. During the science mission, Juno will perform two types of orbits, MWR Orbits and Gravity Science Passes. These two types of orbits differ from one another in terms of spacecraft orientation. Either the Microwave Radiometer or the gravity science experiment can be operated at the same time, because those two studies require different orientations of the spacecraft. For the gravity experiment, the High Gain Antenna needs to be pointed directly at Earth so that Ka-Band Ranging Signals and X-Band Signals can be sent and received. 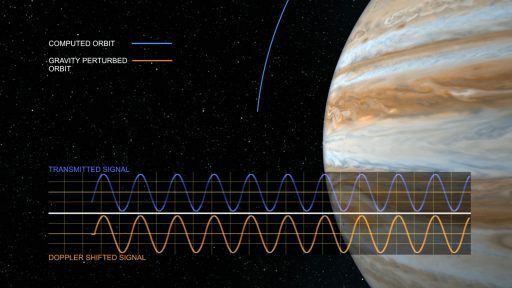 The experiment registers slight changes in frequencies that indicate different gravitational conditions which will be analyzed and will eventually lead to insight in Jupiter’s interior composition. For the MWR passes, Juno’s spin plane needs to be pointing towards Jupiter’s core which enables the Radiometers to scan the surface of the planet from a direct angle. 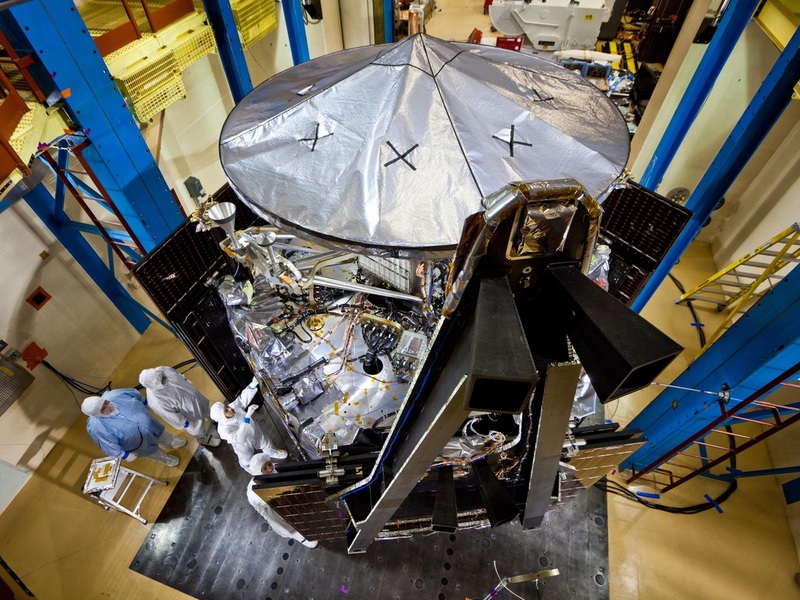 All other instruments can acquire science data during these two different attitude passes. There are only 5 MWR Orbits during the mission that are sufficient to meet the Radiometry mission objectives. These orbits are orbit 2, orbits 6 through 9, and 14. All other science orbits are Gravity Science Orbits. MWR is in stand by mode during orbit 8 and turned off afterwards. To perform Gravity Science for the rest of the flight, the orbit has to be designed in a way that allows Ka-Doppler Ranging from Earth. The Deep Space Network has only one Station capable of providing Ka-Band uplink which is Deep Space Station 25 at DSN Goldstone. 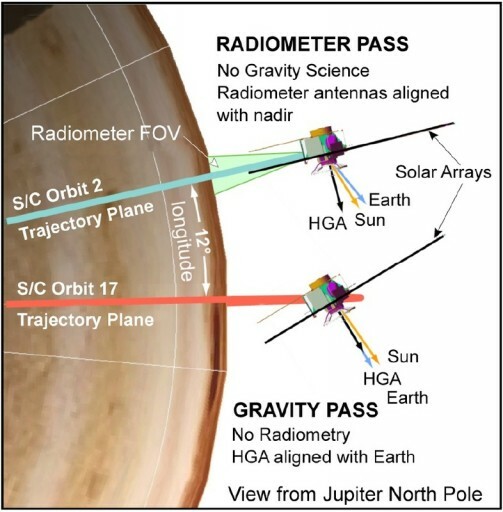 This means that the perijove science pass (for gravity science: +/- 4 hours) has to occur when Jupiter and Juno is visible from DSN Goldstone. 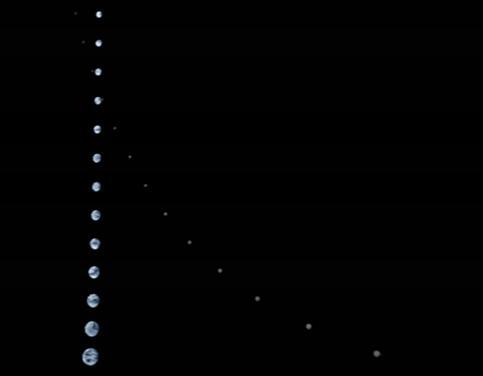 The Jupiter view period at DSS-25 repeats every 0.9975 days, so the orbit of Juno must have a period that represents an integer multiple of that period so that Jupiter is constantly visible from Goldstone for science passes. The orbit was chosen as 14 days x 0.9975 days which equates to an orbital period of precisely 13.965 days. The five MWR orbits feature additional tracking windows outside the perijove science phase because the is no tracking during this period since there is no High Gain Antenna Communications availability due to vehicle attitude. This requires two hours of additional tracking by Goldstone at the end of the science passage and an additional 8-hour communications pass at P+1 day. Juno’s orbit has an initial perijove passage at a latitude of 3 degrees on Jupiter followed by the descending node of its orbit (analog: Earth Orbit – descending node: equator crossing) several minutes after that. The argument of perijove increased y about 0.9 degrees each orbit which causes the latitude of perijove to move further from the equator, which in turn forces the line of apsides to rotate. That causes the radiation dose to increase dramatically as Juno gets closer to the powerful radiation belts of Jupiter. 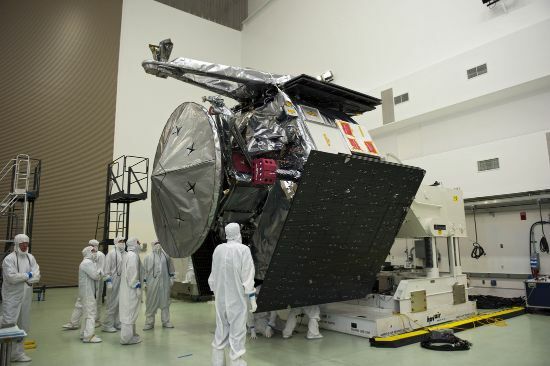 The mission was designed to keep the radiation dose minimal during the first 16 science orbits to provide a 24-degree resolution of science data which meets most of the mission’s objectives, so that the risk that comes with increasing radiation on the vehicle can be accepted. 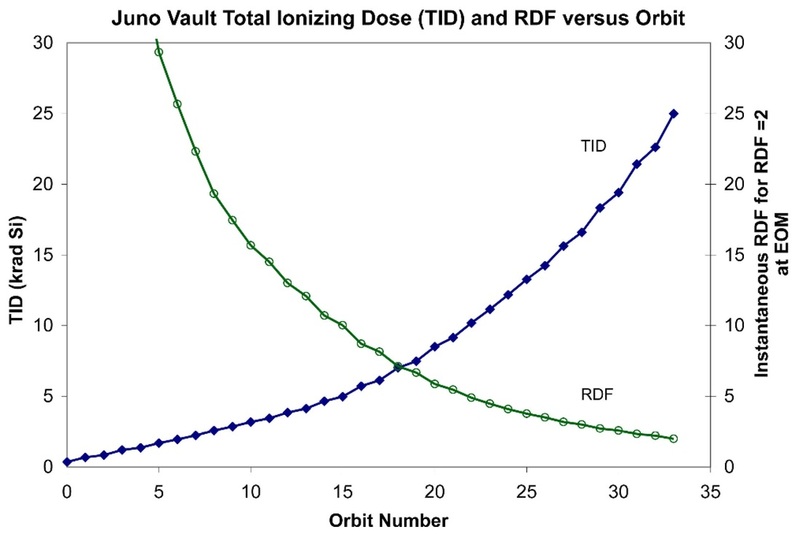 During the first 16 orbits, Juno experiences 20% of the total radiation dose of the mission with the majority following during the remaining orbits since radiation during cruise is low. Reducing the overall radiation dose of the first 16 orbits was achieved by locating the first perijove pass close to the equator and approach from the North Pole. A South Pole approach would have caused Juno to lose six degrees that would move the vehicle into the high radiation environment six orbits earlier. Summing up, Juno enters a highly elliptical capture orbit around Jupiter at Launch+5 years followed by a period reduction maneuver and an initial set-up orbit. Then, the spacecraft performs 33 nominal science orbits to achieve an acceptable ground resolution at 12-degree spacing that enabled the Magnetometer Study to achieve its mission objectives. One additional contingency orbit can be used to account for a missed perijove passage in order to obtain a full science data set. 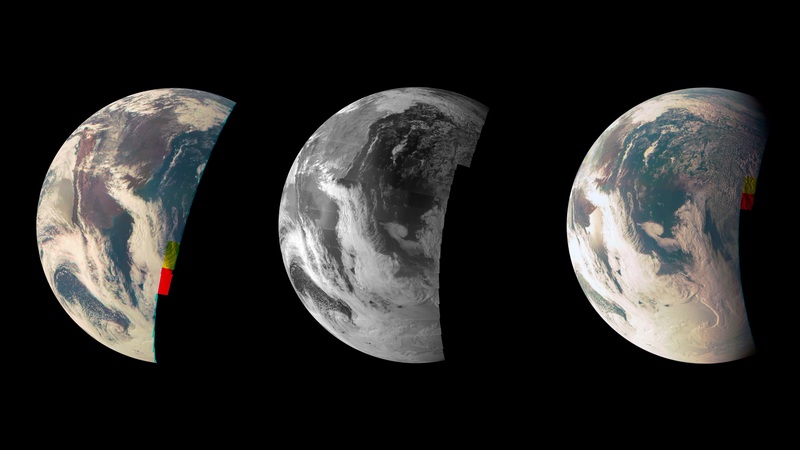 After the nominal 37-orbit mission, Juno prepares to end its mission via destructive entry. After passing perijove on Orbit 37, Juno makes one last Orbit Trim Maneuver and waits until apojove to perform is deorbit maneuver. Making a controllable deorbit is a requirement of NASA’s Planetary Protection Guidelines. 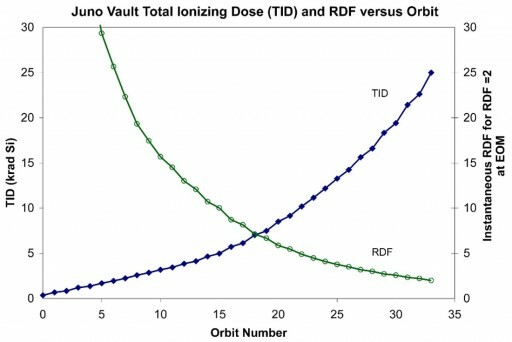 Deorbiting the vehicle after a base-lined number of orbits is important since the qualification radiation dose is exceeded on additional orbits – increasing the risk of a hardware failure resulting in the less important LOM (Loss of Mission) at that point, but also presenting the problem of hazardous debris in a highly elliptical orbit crossing the trajectories of the Galilean Moons Callisto, Ganymede and Europa. These satellites are believed to have liquid water oceans beneath their icy surfaces which leads to the possibility that these moons could theoretically support life. 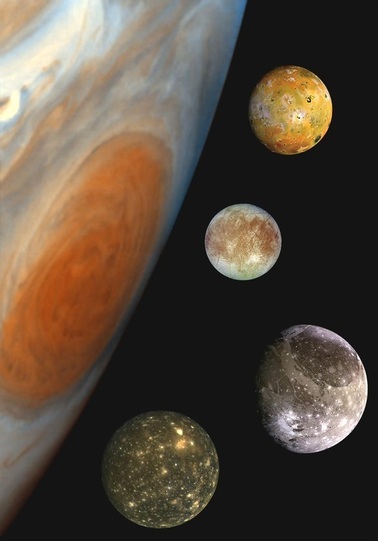 De-Orbiting Juno eliminates the probability of a collision of the vehicle with one of these moons that could cause a contamination of any sub-surface oceans with hazardous propellants that are still inside Juno’s tanks (Hydrazine and Nitrogen Tetroxide). The Deorbit Phase of the Juno Mission begins several days after starting Orbit 37 of the mission and has a duration of 5.5 days. At apojove, Juno uses its two Top Deck Engine Modules to start two of its Reaction Control Thrusters for the deorbit burn. The burn slows Juno down by 75m/s which is sufficient to place its perijove well into the dense layers of the Gas Planet, aiming for a low point at -700km (Oblate altitude). 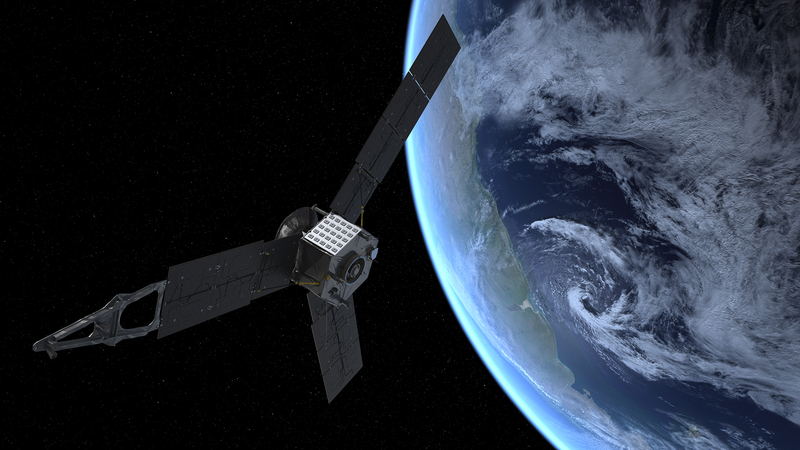 Afterwards, Juno is undergoing passivation and cuts communications to Earth. Juno continues its final lap of the orbit until reaching 34 degrees north latitude where it dips into the cloud cover of Jupiter. The Jovian ‘Atmosphere’ has a higher density than that of Earth and Juno literally slams into it at a high velocity, causing the spacecraft to disintegrate and burn up for a furious end of its mission. Juno’s demise is expected on February 20, 2018 at 11:39 UTC Spacecraft Time. After the end of the Juno Spacecraft Mission, teams and scientists are involved in data analysis and data product generation for at least two years. All data from the individual instruments is being analyzed be the instrument teams before scientists take a look at combined data sets to address Juno’s Mission Objectives. Editor’s Note: This outline of the Juno mission was created on a best efforts basis, but there are no guarantees for preliminary information that is given and for the dV and TIG values of the individual burns as well as the exact timings of individual events which are still subject to change as Juno fine-tunes its course. This is due to changes that were made to the Juno Flight Profile during and late into the design process so that information that was available as source material (various NASA, JPL and Caltech Papers) might have contained outdated information. 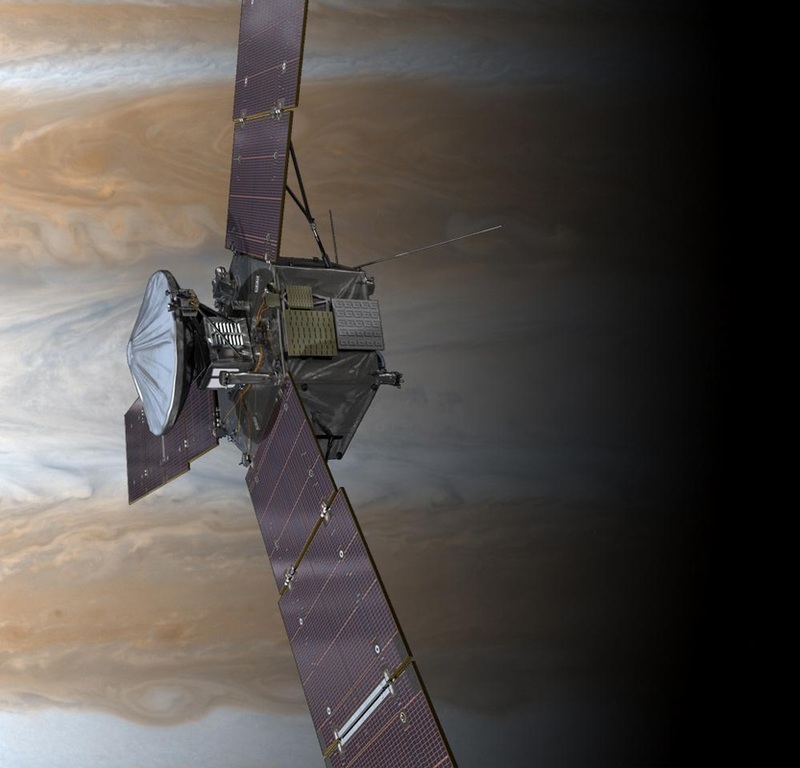 Refer to the Juno Mission Updates Section for the latest news and mission parameters.